So back in December I asked for photo book making recommendations— maybe you remember. The idea was that, for Christmas, I was going to put together a book of our wedding photos for our parents to hold them over until we received the (much higher end) photo books from our photographers. I received some good information and links, and decided to go with Blurb. Uh, like, start sooner. Apparently I will never learn. Alternatively, I could have accepted that I wasn’t going to finish by Christmas and waited to receive the DVDs of fully-edited high res photos from our photographers. The discs arrived in the mail just as I was finishing the books, too late. Since I was downloading the giant files from the online gallery of our photos, just getting the photos took forever. For-ev-er. Had I started earlier, it would have been less frustrating when it took eons for my less-than-speedy computer to deal with those giant files. It took many many minutes just to place each photo. Argh. The slooooowness of the process led to me working on this project into the wee hours of the morning a few days in a row. I was so tired by the end that I made silly mistakes– underestimating the bleed (re: chopping tops of heads off), leaving space between photos where there shouldn’t have been space, etc. Again, starting earlier would have made the not-so-speedy-delivery less aggravating. It was about 10 days between ordering and delivery, which is not so bad really, but it’s not the quickness I’m used to. We gave Pat’s parents their book when they were out to visit on New Years’ day and just gave my parents theirs when we were at their house a couple weeks ago. 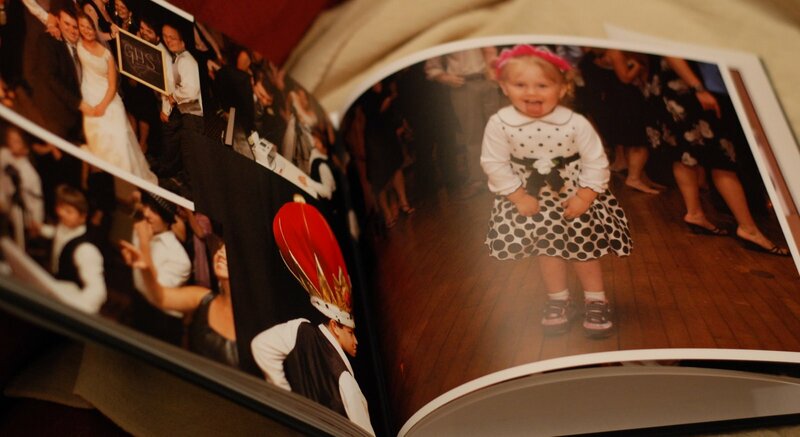 Lastly, this project should not have been my first photo book. Again, better laid plans– I should have done a practice run with a smaller, less time-sensitive (and consuming) book. I honestly don’t blame Blurb for the slowness– it was mostly my computer, and partially the size of the files. Had I started earlier (or accepted that it wasn’t going to be ready by Christmas), many of the problems I ran into either wouldn’t have happened or wouldn’t have been as frustrating. So, the good parts. 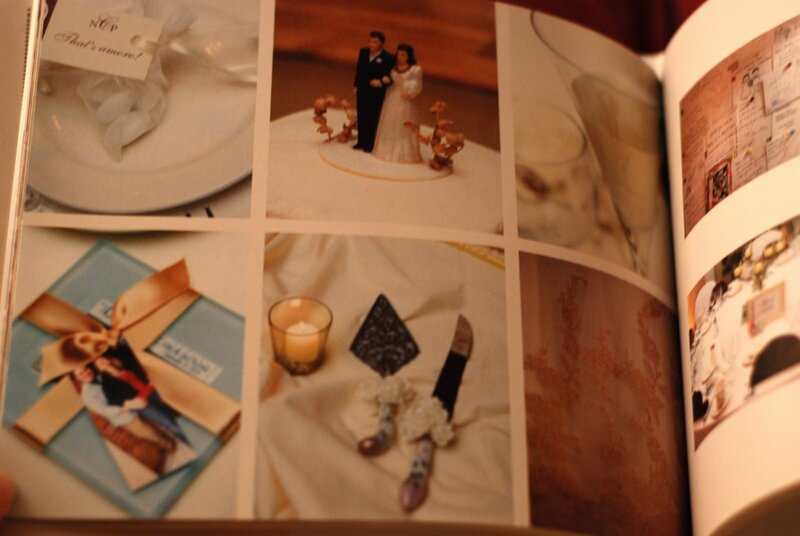 I love how the book came out. The print quality is good, the paper quality is lovely (I upgraded to the premium paper), and everyone who’s seen it has gushed over it. I made three 80-page books, each one is hardcover with a dust jacket, and made with the premium paper. They came to about $42 each. This is a bargain for such a gorgeous book. I was happy with Blurb’s layout software– while not entirely customizable, it offered enough options for me. There were a few things that were a bit limiting, but overall it was fine for what I was doing. Another nice thing about putting together our own book was being able to incorporate some guest photos in addition to the pro photos. I put together a page using our friends’ photos from our rehearsal and rehearsal dinner and used a few guest photos from the reception as well. I’m looking forward to doing a book of our honeymoon photos and working on some books as a way of finally organizing the thousands upon thousands of photos we’ve taken over the years– and hopefully keeping it up in the future. I love the idea of having a bookshelf full of our photobooks, neatly organized by year or adventure or occasion, ready to be flipped through at any time. 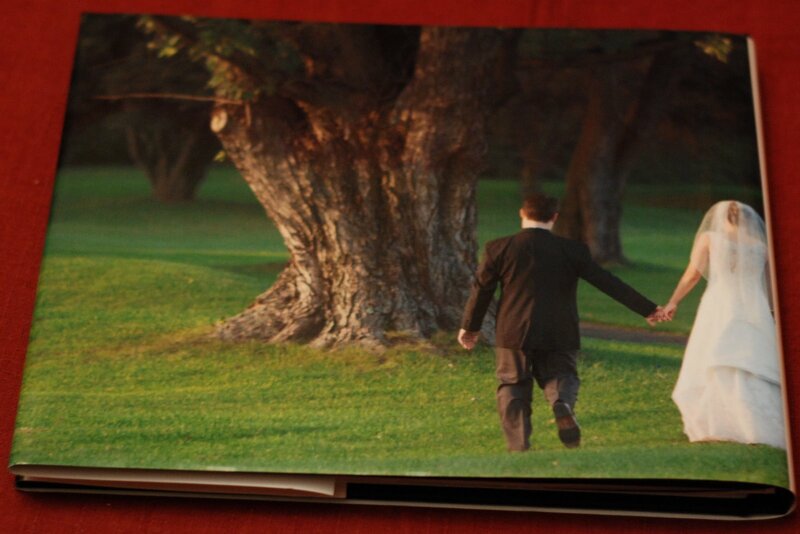 Having the captured moments on Flickr is nice, but having them in a book in one’s hand is even nicer.